Safe, 100% organic and naturally grown without pesticides, artificial fertilizers or chemicals, producing wonderful results in your body, naturally. This Maca is naturally sun dried with no oven, alcohol or artificial heating used, to insure all the nutrients are locked into the herb and not artificially dried out of it. This maca is grown and harvested under the controlled fields and supervision to insure you get the purest grade of maca that can be found. Unlike some maca that is bought on the open market where you are unsure where and what you are really getting. 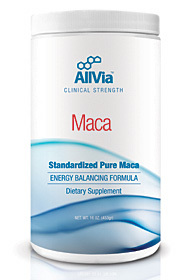 Allvia pharmaceutical insures that you get purity, USP grade maca, which means when tested it must contain exactly what the label says, no chemicals or contaminants and all the naturally occurring components that the plant has. Nothing removed by poor growing, harvesting or processing methods. Maca contains large amounts of dense vitamins and a broad spectrum of minerals. The herb was originally studied because of its ability to ward off malnutrition in the poorer regions of Peru. Properly grown Maca is especially high and dense in trace minerals and phytosterol's which has proven to be successful in promoting superb health. In the USA trace minerals become depleted from over production and chemically treated farmed lands which hampers the plants ability to find and uptake minerals from the once rich soil. Without minerals your bodies hormonal production is virtually brought to a stand still. With hormone production at a stand still, and the bodies need for these for normal functioning, a women shows signs of an inability to cope with everyday occurrences. She may feel a lack of vitality and luster for life and even show signs of emotional and physical problems. Women who have taken maca have found recovery from chronic fatigue, fibromyalgia,Pmdd, Pcos, menopause and various other health problems that pharmaceuticals have not helped. Maca is an overall tonic for the body like an adaptogen Maca builds the body with energetic qualities that our regular food sources seem to not be able to do. It is therefore a herb of great benefit to those with less than ideal health, fatigue, mood disorders, poor nutrition from diet or poor absorption and menopause related symptoms. Many doctors in the US and Europe believe maca is a good choice as an alternative therapy for menopause and chronic fatigue as it allows a woman to produce her own hormones and strengthen the body without using drugs that ultimately weakens a womans natural abilities to overcome natural changes in her life. Blend 1 scoop of maca with your breakfast milk or orange juice and put some yogurt or fresh fruit in with it to make an energizing life sustaining drink. Maca also can be added to shakes, cereals and will enhance the nutritional value of cookies, pasta and other baked dishes. No known side effects have been reported with the use of maca. Vitamins: Thiamin, Riboflavin, Niacin, Ascorbic Acid. Amino Acids: Alanine, Arginie, Aspartate, Glycine, Sarcosine, Glutamine, Histidnet, Isoleucinet, Leucinet, Lysinet, Methioniet, Phenylalaninet, Serine, Valinet, Threoninet, Proline, Hydroxproline. Phytosterols: Sitosterol, Campesterol, Brassicasterol, Ergosterol, Ergostadienol. This container contains 1 lb of finely ground and dried maca. It is the equivalent to 12 bottles of the capsule maca, without the capsule you get better absorption and your body will respond with greater results.